Adam and I were lucky enough to join the family on a trip to Phoenix, Arizona for a Baker family reunion over Christmas. I had never been to Arizona, and hadn't had the chance to really get to know the Baker side of the family, so I was especially excited for the trip. After a long delay in Atlanta, we finally arrived in Phoenix at around 12:30am local time (2:30am Atlanta time). We obviously went straight to the hotel and passed out, since we had to be up and at the house at 8am the next morning for skydiving! Today was skydiving day! Out of the 23 family members that were in town, 18 of us jumped (Thank you, Grandpa Baker!). Adam and I were part of the first of five groups to jump so it was a balmy 3 degrees when we jumped out of the plane. Seriously, so cold. I didn't think my hands were ever going to thaw out once I landed. This was my third jump and Adam's first! Here we are defrosting after our jump. All of the cousins jumped, and so did Grandpa Baker and his three kids (Liz, Susan and Dave). Here they are before Grandpa's jump. And here's a picture of the original Baker sibs after they landed. They all got to go on the same trip, so that was fun! It was a long day, especially after our super delayed flight, but it gave me time to get to know all of the other cousins which was awesome. Adam, who generally can't fall asleep anywhere but in a bed, fell asleep at the airport and the skydiving place (which was Skydive Phoenix, if you're interested). Merry Christmas Eve! We started the day with family pictures at The Baker's. I don't have a family shot to share, but here's one of me and Adam. Sorry your face is in the sun, Adam. I also caught this picture of Adam and his cousin's daughter, Willow. She is too adorable, but is very wary of strangers so it took awhile for her to warm up to us. This picture really makes my heart melt! Adam is so adorable with little kids. We spent the rest of the day at Dave's cousin's house - Mary Beth, and then went to a wonderful Christmas Eve Service at Grandma and Grandpa's church. Another great day of family fun! Merry Christmas! We had another wonderful day with the Baker family, but it wouldn't be us if we didn't kick start the day with a little incident, would it? On our way to the house we were stopping at CVS for some chips and salsa (guilty) and some Benadryl (my skin does not do well with climate changes). So really, you could put all the blame on me for this one. Anyway, we were driving through the CVS parking lot, and all of a sudden Meagan screams. About .02 seconds later, we nailed a random, diamond median in the middle of the parking lot - and I'm pretty sure we caught some serious air. The poor car limps over to a parking spot, and we all get out to assess the damage. Turns out we popped two tires in the process of our unplanned joy ride...whoopsie! Adam and Nathan changed the tire in like 10 minutes - seriously so fast - and then we hobbled over to the Baker's house. I could go into more detail on what a hassle that incident caused, but I won't bore you with the details. Oh, and the CVS was closed. We spent the day playing Dirty Santa and hanging out by the pool (jealous? ), and then ate a delish Christmas dinner courtesy of the Leonards! I was also able to swing by Jack in the Box for a couple amazing post-dinner tacos. However, it was never lost in the day what today, Christmas, is all about. We are so very thankful for all of the amazing blessings He has given us in our short lives, and constantly make a point to not take Him or any of His blessings for granted. Our first Christmas as Bakers! On our last day in Phoenix, the boys and girls split up to do what they do best: golf and shop. So the ladies headed to Old Town Scottsdale for the day. We ate Mexican food for lunch (all of my Arizona goals have now been accomplished! ), and then walked and shopped for the rest of the afternoon. And of course we had to stop for ice cream and milkshakes! We had such an amazing time in Arizona, and Adam and I are both so happy we got to spend some quality time with the extended Baker family! Thank you again, Grandpa and Grandma, for bringing us all together for the holidays! This year marked our first Christmas! Since we were traveling to Arizona for the Christmas holiday, we celebrated ours a little early (December 21, to be exact). It didn't seem too Christmas-y since I worked all day, but it was still so wonderful. While I was at work, I told Adam that I wanted to start some fun Christmas traditions (since I'm trying real hard to start fun holiday traditions). He told me that he had a few in mind, and he would surprise me when I got home. Seriously, he's the best. When I got home, he revealed our new Christmas traditions! 1. He ordered pizza (specifically Papa John's)! We obviously won't be continuing this tradition, since I don't think Papa John's delivers pizza on Christmas morning, but it was so perfect for that night. 2. We had to say "Merry Christmas!" and give each other a kiss after each present was opened. I'm sure this one will wear off after awhile, but we had fun laughing about it! 3. While we open presents, we will always wear tacky hats. His original plan was for us to wear tacky sweaters, but he couldn't track one down for himself at the Thrift Store - so tacky hats it is! I'm sure our kids will be thrilled to partake in this fun tradition. We both totally racked up on the loot (and Ruthie got a yummy bone, too! ), but I obviously think I got the best presents. This one was my absolute favorite! Mainly because he made it all by himself, and I didn't even tell him it's what I wanted. In case the picture doesn't really make sense, I'll clarify. He bought those two frames and got rid of the backing. Then he nailed two rows of string to each frame, and the pictures are held up with clothes pins. So creative! Last night marked the 5th Annual Lassiter HS Baseball Christmas Party, and even though that title is plenty long, I think it requires some background discussion. Adam has played baseball his entire life. Ever since he could talk he would walk around with his toy bat and say "I play baseball?" 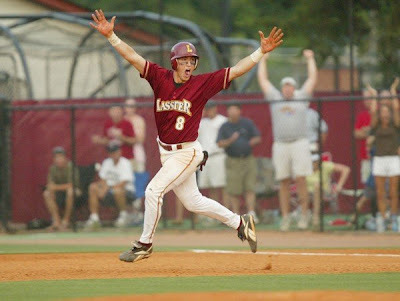 When we first started dating our junior year of high school he was just kicking off baseball season at Lassiter High School. Their team was amazing - they made it all the way to the Georgia AAAAA State Finals, only to lose to Chattahoochee. The next year, there were 12 returning seniors that were lovably coined The Dirty Dozen. We thought the 2005 team was incredible, but in 2006 they were unstoppable - finishing the season 32-4 and going 10-0 in the postseason. Adam was an integral part of the team both years and I will forever cherish all those hours I spent at baseball fields watching the Trojans play. Senior year, Adam hit a walk-off home run in the semi-finals and the AJC got a great picture of it. It is one of my most favorite pictures. 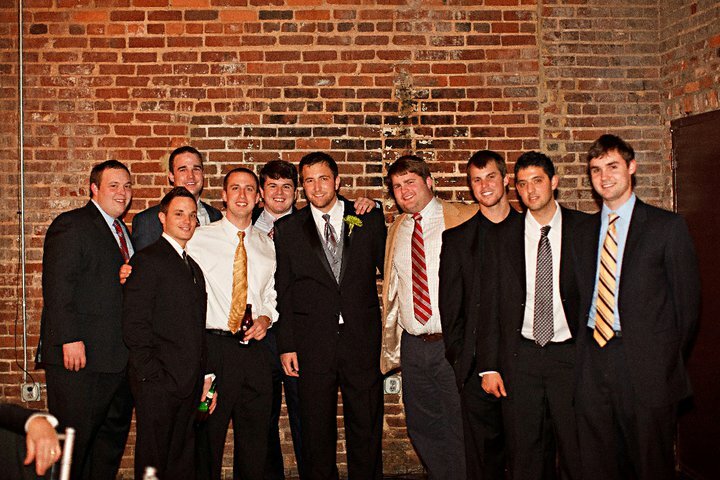 Out of the 12 boys, four of them are married and two are engaged. And out of that, two are married and one is engaged to their high school sweetheart (Adam & I included). We have been invited to all of the weddings, and they were all invited to ours. It is such an amazing group, and I'm so happy the Bishops continue to invite all of us into their home every year. Here's a picture of 11 of the 12 at our wedding. So far we've had the best attendance out of all the weddings! Due, in large part, to the fact that no one is ever doing anything in January. 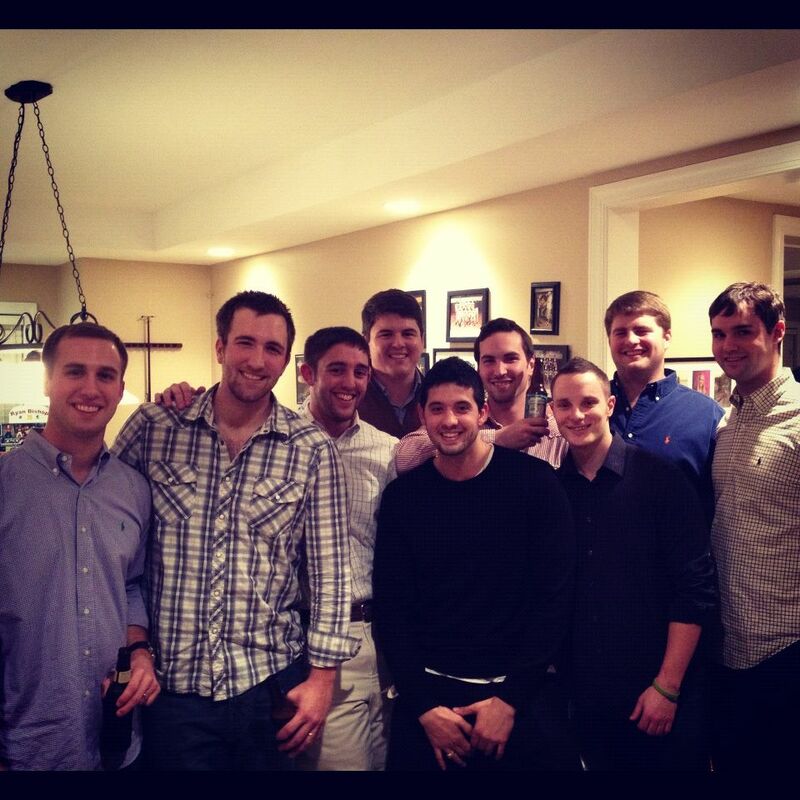 And here's a picture of the group last night. Such a fun time! Even though Christmas is still 6 days away, Adam and I celebrated Christmas with our families this past weekend as we will be in Arizona for the actual holiday. We had a wonderful weekend full of friends and family, which are my absolute fave! Saturday was the Baker Christmas, where we exchanged gifts with Adam's family. Then the whole crew headed to Canoe, a delish restaurant in Vinings, for Debbie's birthday dinner. The food was amazing, and even though I was beyond full - I headed to Barcelona Wine Bar in Inman Park to celebrate a long-time friend's birthday. Here's a picture of our good-lookin' crowd at Jared's birthday. On Sunday, Adam, Ruthie and I went on a 4 mile hike around Lake Allatoona with Debbie, Dave and their pups. It was such a beautiful day, and we had a great time chatting with the in-laws. I think Ruthie will sleep for the next week, at least. After our jaunt around the lake, we headed home to get ready for family Christmas round two at my parents' house. We ate some yummy, yummy Mexican food, opened presents, and watched Christmas Vacation (a family fave). Adam scored big time this year with a guitar! He's been wanting one for some time, and my parents surprised him with one for Christmas. He was nice enough to wake me up this morning by attempting to play me a song (did I mention he doesn't know one thing about guitars?). And now we have a busy, busy week full of more family and friends! I'll be sure to post pictures of all my handmade gifts when I get a chance. On December 1, our little family moved into our new home! Here's a picture of our first morning in the new place, and Adam and Ruthie playing with a dead tree (gosh, that's ridiculous) in our new backyard. Last year at work, we all received iPads as our Christmas gift. And this year they surprised us with iPhones! This is so crucial, especially for Adam because now he doesn't have to listen to me complain/beg for one. My little brother, Mitchy, is a senior left tackle on the Lassiter High School Football team (#74!) and they made it to the state semi-finals for the first time in school history! Although they ended up losing, it was an amazing game and they are the winningest senior class at LHS! I'm so glad Adam and I were able to make it to most of his playoff games - it really was fun to be a part of. It's so cold in the D! We had client meetings all last week, and they happened to be in Detroit. It was absolutely freezing, but it snowed on Friday which was so gorgeous. Below is a picture of the cutest little area called Royal Oak, and a picture of me in the snow! December 13 marked my beautiful mother-in-law's 50th birthday! The whole family gathered at the original Bakers' and ate some yummy 'za. I got her the best present (obviously), it's the pretty frame on the left! It's actually pretty cool: Instead of a picture, I put notebook paper in the frame. Then I added those perty flowers and left her a note! I also hot glued velcro to the back of the frame and the dry-erase marker so she could change out the message, and not lose the pen. Here's where I got the idea. Adam and I are blessed to have a pretty packed schedule between now and the New Year, and are excited to spend some QT with our family and friends. Holy cow, it's DECEMBER! Everyone at work always makes fun of me for getting so worked up at the beginning of each month, but it really does shock me how fast time goes by. I'm kick-starting this month by wrapping up my month of thanks. I am thankful for random acts of kindness. I am thankful for how little it takes to make someones day - that every smile matters. I am thankful for the kind people I have in my life that just constantly warm my hear. I am thankful for traditions. I am thankful that Adam and I get to start making our own holiday traditions this year. I am thankful for Pinterest for giving me so many good ideas for traditions to start this year and carry on forever. I am thankful for vacations! I am thankful that I have the next four days off of work to spend time with the hubs and our wonderful families. I am thankful that I don't work in retail, so I don't have to prepare for the craziness of Black Friday/Weekend. November 24 - Happy Thanksgiving! I am just plain thankful! I am thankful that I was able to spend the day with both of our families. I am thankful for the crazy, loud, informal Thanksgiving at my parents' house and the calm, formal Thanksgiving at Meagan & Nathan's. I am thankful that I got to enjoy the best of both worlds on such a wonderful day. I am thankful for the holiday season. I am thankful that I can officially start listening to Christmas music! I am thankful for the quality time we will be spending with our families, and the overall joyfulness of the season. I am thankful for Coach Irwin of the Lassiter HS Football team. I am thankful that my little brother, Mitchell, gets to play often and that he has not been hurt. But more so, I am thankful for Coach Irwin's giving heart to the Foster family. I don't think he has any idea what kind of impact he is having on that family. Click here to read more. I am thankful my mom is a realtor! I am thankful that she held our hand during this rental process and that we officially have the keys to our new house! I honestly don't know how we would have done it without her, and I most certainly don't know how people go through the process of buying a house without losing their minds! I am thankful for books (and I can't believe it's taken me 29 days to be thankful for this!). I am so thankful that I absolutely love reading. I am thankful for the many worlds I have been transported to through reading. I am thankful that I can get lost in a good book for hours, even days. I am thankful that no matter what my mood, I can always count on a good book to instantly relax me. I am thankful that I have so many things to be thankful for. I am thankful that over the past 29 days, it has been relatively easy to be thankful for something different every day. I am thankful for all of the blessings I have received in my short life of 23 years.